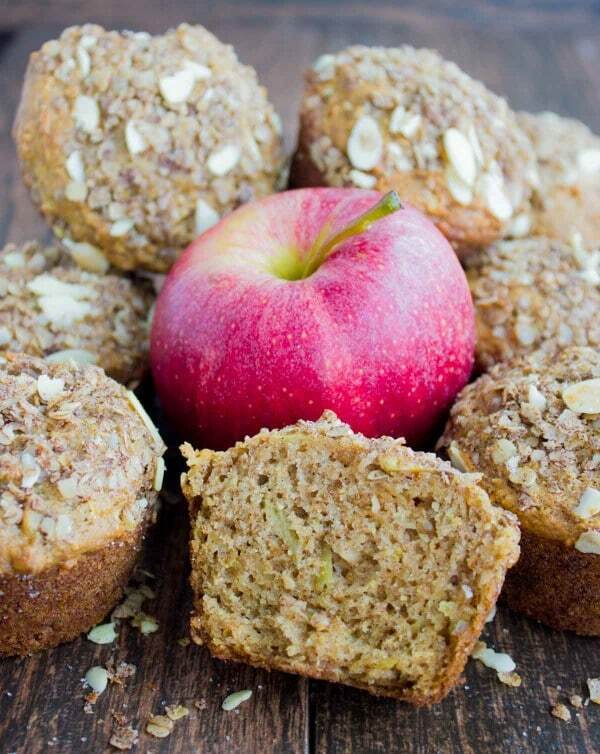 These healthy Whole Wheat Apple Cinnamon Muffins have the perfect amount of sweetness, little fruity pockets of apples, and a sweet almond crunch topping! Start your morning right with this wholesome breakfast muffin! 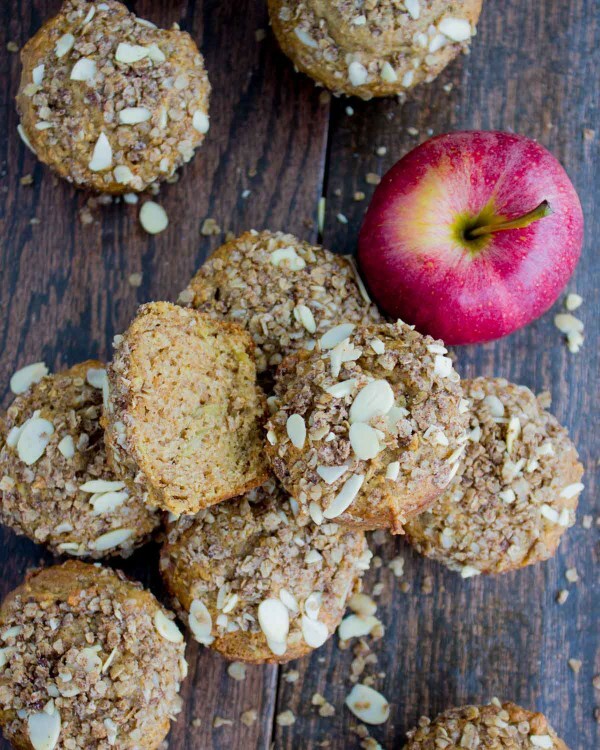 These Whole Wheat Apple Cinnamon Muffins are hearty, tender, light and perfectly balanced. Not too sweet, packed with apples, spiced with cinnamon and topped with an oatmeal almond cinnamon crunch. The whole wheat flour adds extra fibre and a nutty taste. A guilt-free version of the coffee shop favourite apple cinnamon muffin. A good Apple Cinnamon Muffin recipe is one of those essential breakfast muffin recipes to have on hand. For starters, it has apples and cinnamon as main ingredients – hello comfort food. Also, it’s a super easy muffin batter, meaning you need one bowl and a whisk to get it ready. Simply whisk the batter while the oven preheats and after only 15 minutes baking time there will be Apple Cinnamon Muffins ready to be devoured! 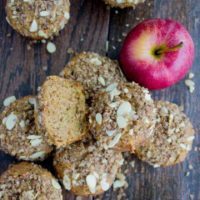 As a bonus, these healthy Apple Cinnamon Muffins are not too sweet so you don’t feel heavy or guilty. They are made with whole wheat flour lending them a nice nutty flavor and a good hearty wholesome feeling. 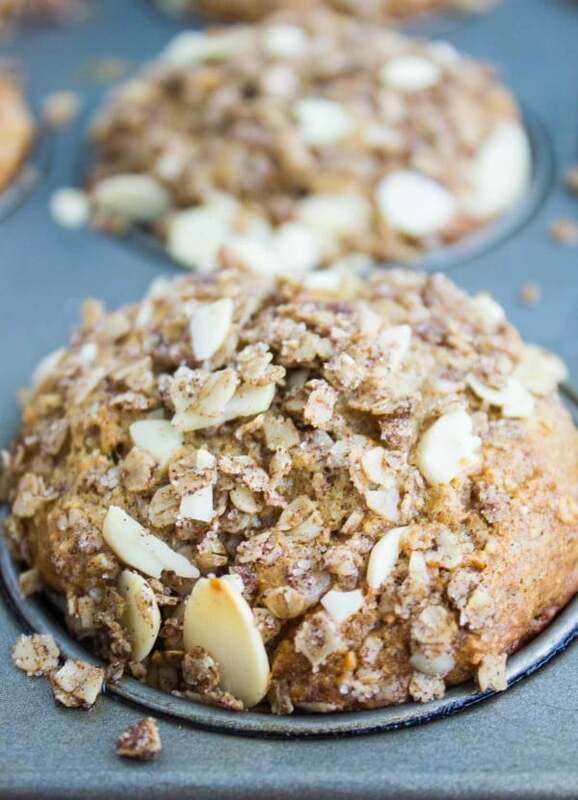 Let’s not forget the oatmeal almond crunch topping which is like the icing on the muffin!—So why wouldn’t this Whole Wheat Apple Cinnamon Muffin be an essential baking recipe? All baking fears aside, muffins shouldn’t really be considered baking. They’re straightforward, forgiving and really really easy to make. If anyone tells you otherwise, I’d like to know who! Preheat your oven to 375 degrees F and grease or line your muffin pan with paper liners. Take another large bowl and add the egg, yogurt, brown sugar, oil and cinnamon and whisk them together well. Now, add in the flour mixture and apples and use a spatula to mix everything together until it’s just blended—but still has some visible lumps of batter. Divide the Apple Cinnamon Muffin batter among the muffin pan and sprinkle a generous 1/2 teaspoon of crunchy topping on top of each muffin. Bake the apple muffins for 15-18 minutes until a toothpick comes out clean when inserted in the middle of the muffin. Do not overmix the batter or your Apple Cinnamon Muffins will be tough. These Apple Cinnamon Muffins stay fresh for at least 3 days when stored in an airtight container. You can also wrap them in cling film individually. I sometimes add ginger to the muffin batter, sometimes apple pie spice, and sometimes skip the cinnamon and all other spices, and just add vanilla. Grease or line your muffin pan with paper liners. In a small bowl whisk in the flour, baking soda and salt. Set that bowl aside. In a large bowl, add the egg, yogurt, brown sugar, oil and cinnamon and whisk them well. then add in the flour mixture and apples. Use a spatula to mix everything together until it’s blended—but still has some visible lumps of batter. Do not over mix the batter. Mix all the ingredients for the topping in a small bowl. Divide the batter among the muffin pan and sprinkle a generous 1/2 teaspoon of crunchy topping on top of each muffin. It's best if the muffins rest 10 minutes before baking to allow for the whole wheat flour to soak up some moisture. Bake the muffins for 15-18 minutes until a toothpick comes out clean when inserted in the middle of the muffin. These look perfect and I love the crumb topping! The perfect snack on a rainy fall morning! Wow, those muffins look so hearty and absolutely delicious. These are perfect for this time of the year — all the yummy flavors of fall in one delicious muffin. These would be great for an after-school snack for my grandkids. I am always on the lookout for healthy treats. Gramma needs to bake a batch of these up soon. Whole wheat baked goods are my jam. These look wonderful! I’ll be trying them at home soon. Love apple muffins but never made them in whole wheat. This sounds like a great recipe. Next time I make apple muffins I must try making whole wheat. 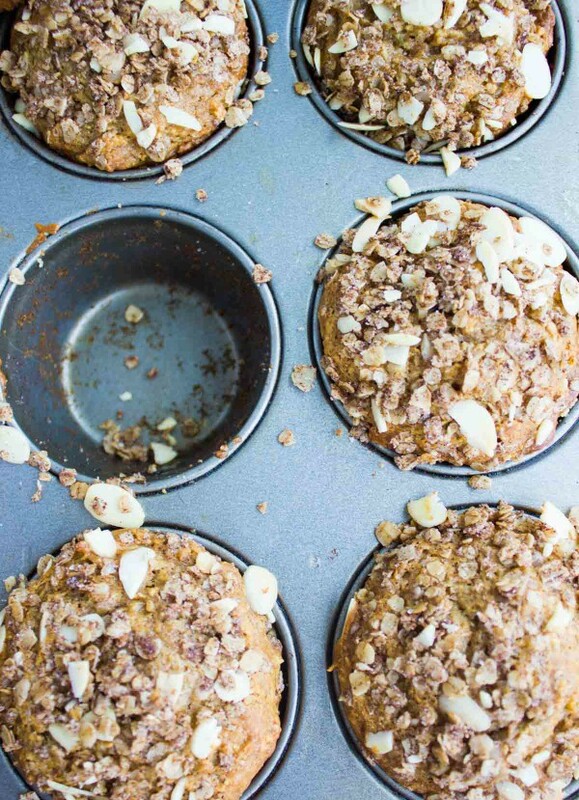 The apple cinnamon muffins looks fantastic — and I bet they taste even better. The muffins would make wonderful treats for after school or even in the lunch box. Frankly, I’d love to have one right now with my coffee. Apples are just delicious this time of year. This muffins fit perfectly into Fall story. They look so moist and so flavorful. Can’t wait to give these muffins a try.